Wow, it is hard to believe, but I have now been on the road for six months! This means only six months left until I return to New York or not. At this time I would love to continue traveling, just have to find a way to fund it. I also have to see how I make it through the winter. I just left Glacier National Park in northern Montana and they forecasted five inches of snow for tonight. I am now staying in Cut Bank, a town of 3,200 about 100 miles east of Glacier and the temperatures are dropping fast and the wind is blowing. I am just glad that I bought a small space heater before I left Glacier. This way I don’t have to use my propane to heat the camper. This of course only works when I am hooked-up to electric. One thing I have realized on this trip is that I have to overcome my fears of the unknown. When I left New York, I was petrified of low clearance bridges, the thought of camping without power or water hook-up had not entered my mind (I spent the last four nights without either) and only two weeks ago I freaked out about running into freezing temperatures. How did I overcome those fears? It is a gradual process. Take the approaching winter. Not only was I afraid I wouldn’t make it to Glacier National Park and Bryce Canyon before the temperatures reach the freezing mark. But I also didn’t know how to make sure that the water coming into the camper wouldn’t freeze in the water hose. It took a little time and I just said to myself, so what if it gets really cold. It also helped that I did some research and spoke to people who new the places first hand. Having talked to a fellow RVer about the water situation definitely put my mind at ease. Bottom line, having first hand information and experience is the way to put your fears to rest. More about Montana in the next post. 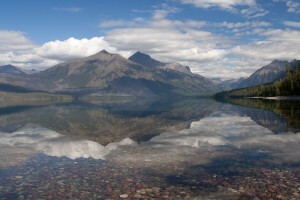 What a fantastic picture of Lake McDonald, Jicki! It looks like a painting, almost unreal! I’m really enjoying your entries. I forward them on to my brother (great outdoorsman and r/v lover) and Cathy White , my best friend in FL. I know what you mean about fear. I have always wanted to drive across the country like you’re doing, but with another person, just staying in hotels/motels. Jim isn’t up for it , his interest isn’t there but I will do it sometime soon. Unfortunately, my brother , whom I adore, has 2 young boys and is really the home person in their family. thank you Susan. When I saw the photo first, I too thought it was a painting. Glacier and Montana in general are beautiful. More to come.